Seattle Boat Accident Attorneys | Davis Law Group, P.S. Boating and personal watercraft accidents account for some of the most serious and traumatic personal injury cases we see at Davis Law Group. All too often, recreational boaters and innocent passengers fall victim to the negligence and recklessness of boaters who put the safety of others in jeopardy. When a person suffers serious bodily injury in a boating accident, state law permits the victim and their affected loved ones to pursue a personal injury claim against the negligent party who caused their injuries, as well as the insurance company covering the boat owner and/or operator. In Washington state, the driver or owner of a boat or other personal watercraft may be held liable for an accident, just as the driver or owner of a car is liable for an accident. Boating accident cases can be complicated and difficult to pursue without legal expertise. It is in the best interests of accident victims to consult an experienced personal injury attorney before proceeding with a boating or maritime accident claim. Call the award-winning legal team at Davis Law Group in Seattle to request a free legal consultation with our attorneys. If you have been injured in a boating accident, it may be in your best interest to consult with an attorney who is experienced in handling maritime accident claims. Mr. Davis and the entire legal team at Davis Law Group have years of experience handling serious, high-damage accident claims. Call (206) 727-4000 for a free, no-obligation consultation. For injured victims who wish to pursue a personal injury claim after a boating accident, establishing liability is key to a successful outcome. It is therefore important to identify all possible factors that may have contributed to the accident in order to determine who is liable or can be held responsible. Proving liability in a boating accident can be difficult without the assistance of an experienced personal injury attorney. A qualified lawyer can help you determine all possible contributing factors and determine whether the person who caused your injuries can be held legally and financially liable. Operator inattention. The the most common cause of general boating accidents in the United States. Improper lookout. A failure to watch for hazards can lead to serious boating accidents. Operator inexperience. Boaters must take courses and understand the rules of the water to reduce the risk of crashes. Excessive speed. Showing off to friends and family by traveling over the posted speed limit is dangerous and can be deadly. Alcohol impairment. Alcohol use is the leading known contributing factor in fatal boating accidents. National crash data shows that in situations where the primary cause of a boating accident was known, boating under the influence (BUI) was listed as the leading factor in 17 percent of all deaths. In some cases involving boating accidents, Washington state law will apply to the people involved. Boats are treated similarly to cars under Washington’s laws; it’s illegal to operate a boat under the influence, you must have a license in order to operate certain types of boat, and you are expected to keep your boat in good repair. Cases involving boating accidents on lakes and rivers will usually be covered under these laws. In some cases, however, a boating accident will happen on land that is not subject to a state’s laws. These cases usually involve large ship disasters in open water or incidents at large ports subject to federal laws. In these cases, a maritime law called the Jones Act is in effect. The Jones Act covers professional seamen while they work offshore; it also may apply to private citizens who are passengers on cruise ships and other private vessels. The Jones Act also covers some items in the ocean that aren’t technically boats, even if they’re considered a “vessel” for legal purposes. Workers on oil drilling rigs are covered under the Jones Act, and sometimes aircraft such as helicopters may be vessels subject to maritime law if they are flown over certain areas of the ocean. Jones Act cases are held to a different standard of proof than most personal injury or worker’s compensation cases. Unlike most worker’s compensation cases, injured workers covered by the Jones Act can seek compensation both from the owner of a vessel and the company that employed them, even if those entities are not the same. It’s often difficult for an injured victim to figure out which laws apply to their case when they’re dealing with the aftermath of a boating accident. It’s a good idea to consult with a personal injury attorney in these cases, since maritime law can be complicated. 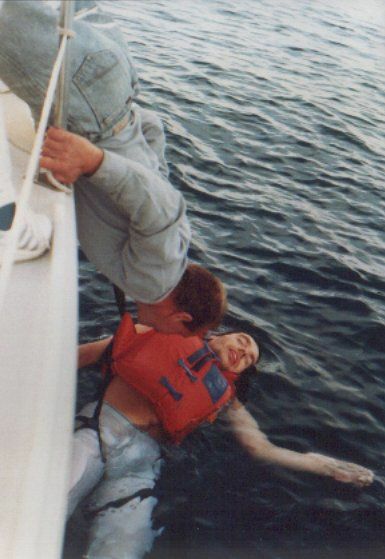 “Capsizings” and “Falls Overboard” accounted for 386 fatalities, nearly 60 percent of all reported boating fatalities. Nine out of every 10 of those victims drowned. “Collision with Another Vessel” was the most reported type of accident. These accidents resulted in 1,366 injuries and accounted for nearly nine million dollars in property damage. Twenty-six children age 12 and under lost their lives while boating in 2001. 137 boaters died in the 40-49 age group category — the highest number reported for any age group. Lower Back Injuries: Lower back injuries can range from general sprains and strains to torn ligaments or broken vertebrae. Getting a clear diagnosis of your injuries after an accident is crucial to building a strong case. Traumatic Brain Injury: Head and brain injuries are common in boating accidents because occupants' heads can jolt and impact other stationary objects inside of the boat. Spinal Cord Injury: The violent motion of a boating accident can cause injuries to the spine or spinal cord. These injuries are very serious and can potentially lead to life-changing conditions such as paralysis or loss of function. Pregnancy Complications: Pregnant mothers are extremely vulnerable in the event of a boat crash, and a serious collision can cause harm to a developing baby. Burn Injuries: High-impact crashes may lead to a boat catching fire, and burn injuries can take a great deal of time to recover from - both physically and emotionally. Wrongful Death: Boating accidents are one of the leading causes of death in the United States, and family members who suffer the loss of a loved one may pursue a wrongful death claim against the at-fault party. If you or a loved one has been injured in a boating accident, Washington state law permits you to recover financial compensation for your injuries, lost wages, medical bills, and other damages you have suffered. Our attorneys have more than 20 years of experience representing people who have been seriously injured due to negligence, and we understand how to properly investigate serious boating accidents. We will review your personal injury case free of charge and help you better understand your legal rights and options. If we believe we can help improve the chances of a successful outcome, our award-winning attorneys will meet with you for a free legal consultation. Contact Davis Law Group today using the confidential contact form on this page or call our office in Seattle at (206) 727-4000 to discuss your case with our legal team. "I, as a father, am eternally grateful that I can rest easy, that my son received the best professional representation possible." "I surely would recommend Davis Law Group to anyone..."
?Can You Be Arrested for Driving a Boat While Intoxicated?